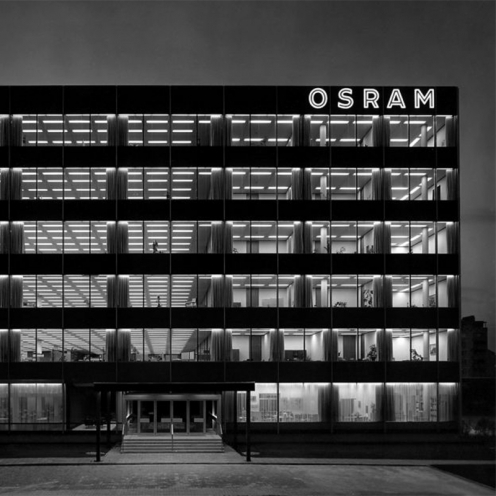 The Osram Building by Proffesor Henn is the crystallisation and starting point of a new development with a strong identity and history. 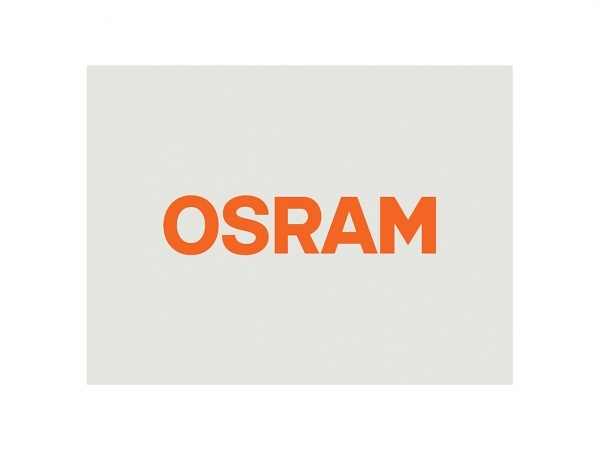 The Osram quarter is conscious of its history and this further development follows the strict positioning, principles and grid of modern architecture. 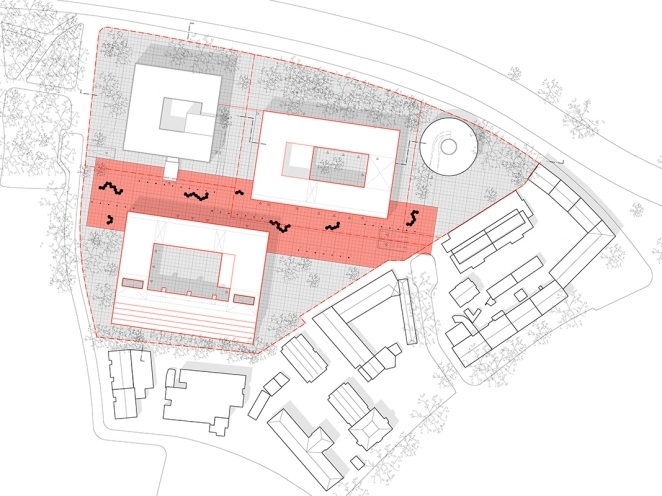 We propose a composition of geometric volumes with functional building types and a serial, harmonious layout. However, the history of the moderns is not ungracefully repeated, but retold, transformed, consolidated, adapted and filled with new content. 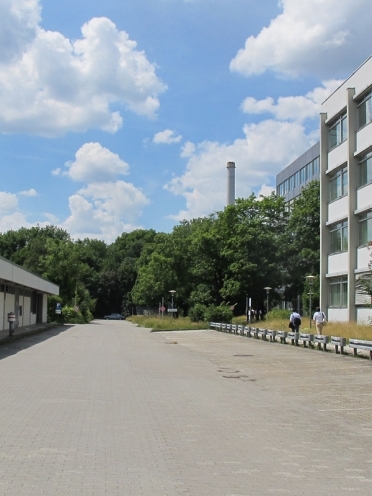 Also in the case of an entirely new development (option A), we propose taking the present stock and the progressive modern history of the old Osram site as a starting point for the new development as a residential location. 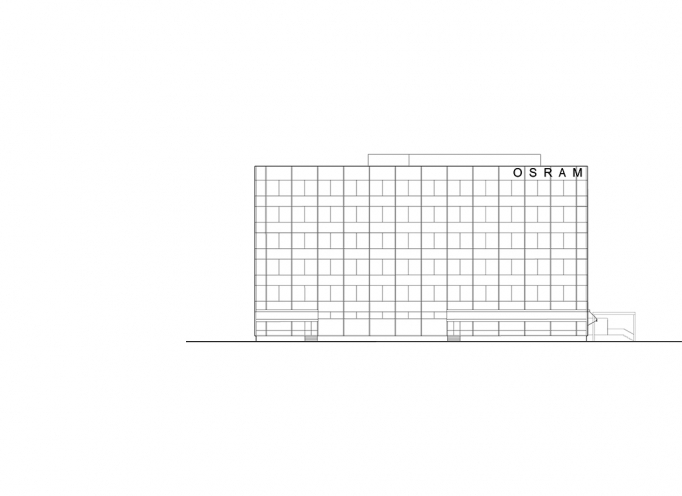 If the Osram buildings must be torn down – though the justification for this premise does not make sense to us - we propose erecting it again in the old form and measurements of a modest ‘classic’ post-war modern building. For the interior, a few original details and support elements could be reused, to generate once again an authentic genius loci. 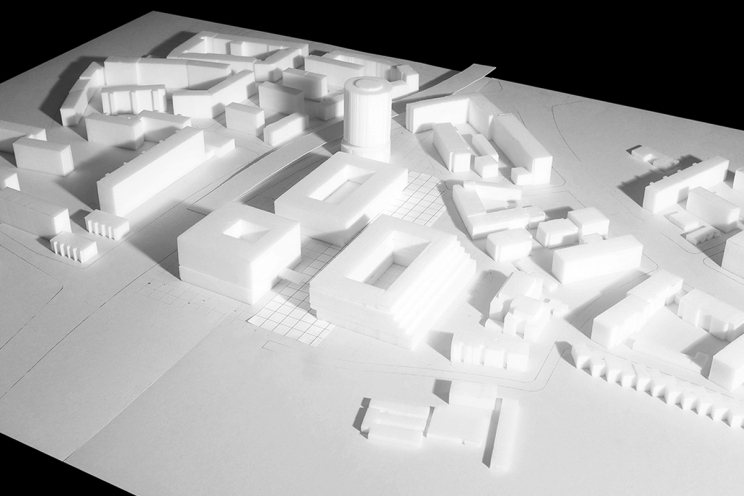 The functional separation of the CIAM moderns will be overruled, in favour of a lively mix of social facilities and care as well as small, functionally less determined, business and residential units. Contrary to the usual problems caused by a plinth of solely businesses or only residential uses, a mix of units offers the opportunity to liven up the ground floor area and generate genuinely urban public space. This, in turn, will offer development and economic activity opportunities for residents. In the envisioned mix of different housing typologies, diverse businesses and social facilities is finally also a contribution to the reduction of mobility needs because it creates a functionally mixed, compact city with short routes. The diversity of uses animate the 6 meter high plinth of the building along the central ‘esplanade’. Similar to the buildings of the Osram quarter, the esplanade is cut precisely and geometrically from the lush landscape of the alluvial lands of the Isar. The contrast and tension between the rational urban density and the wide-open landscape framed the starting point of our considerations. This distinguishes the exceptional character of this quarter. The promises of the modernity to connect architecture and nature are redeemed here. This exceptional location allows for a response with an exceptional building typology and the creation of valuable living space. 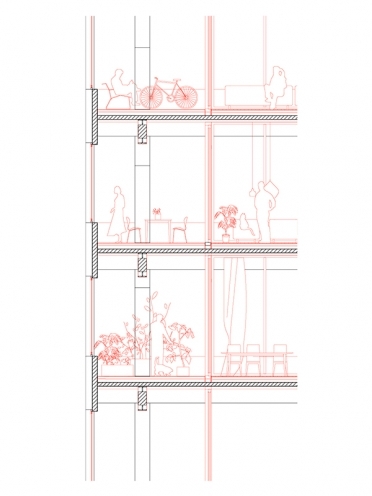 In option A, we consider a markedly higher density of buildings feasible – than required in the brief – and even desirable for the generation of urban life. The ambition for this higher density must take into account the responsible handling of the scarce space available in Munich. In our opinion, this means the requirements regarding building height and open space per inhabitant need to be reviewed. There is an unmediated transition from the neighbourhood into a space of high quality landscape. Thus open space is amply guaranteed. 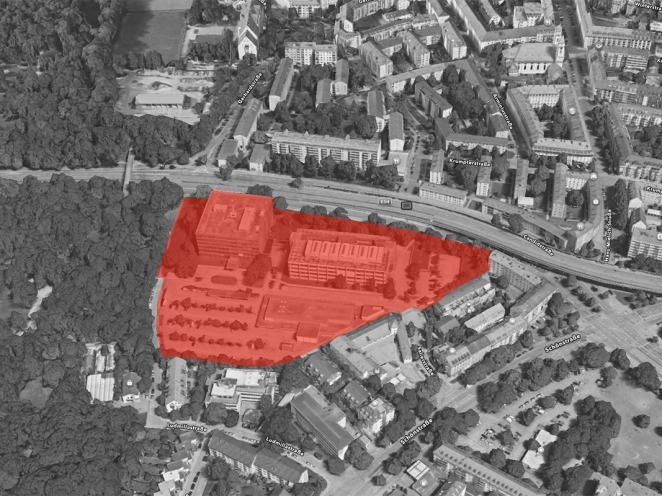 Informed by our analysis of the current situation, option A shows that this location has a considerably higher potential to provide accessible, centrally located and high quality housing, which is sorely needed in Munich. 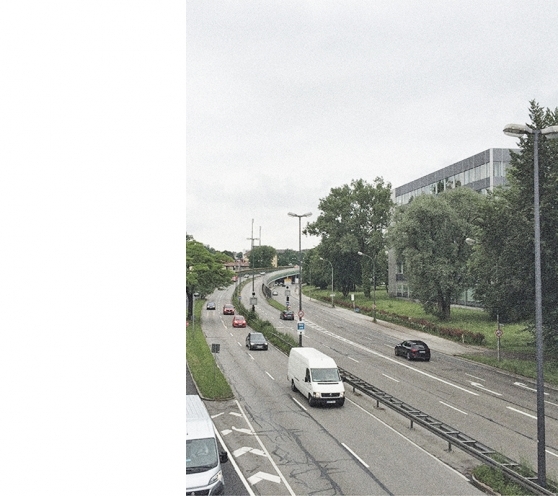 Our architectural approach does not consider the existing, heavily used street merely as a problem, but as an impulse for a new piece of Munich affirming the union of technology and mobility. Should a high-rise such as presented in option A be rejected, we propose in the same location the development of a car park. In defiance of the brief, option B also encompasses a higher building density. The requirements regarding building height and open space, however, are followed. In contrast with the nature of alluvial area of the Isar River, the esplanade is an urban open space. It is a recognizable piece of Munich and now looks as if a straight-angled section of the pedestrian zone is located in the Borough of Untergiesing. How an urban space looks, does not always have to be reinvented. The Munich pavement slabs connected by narrow rhythmic granite strips, the combinable hexagon planters, the typical inner-city street lighting and the freely available metal chairs, are an important part of public space in Munich since the opening of the pedestrian zone in 1972 (planned by Professor Winkler). The formative principles of this open space - in other words, our non-design of these areas – are the recognisability of these urban elements, the affordable nature of the resources and the pragmatic dimension of using existing street furniture and materials. 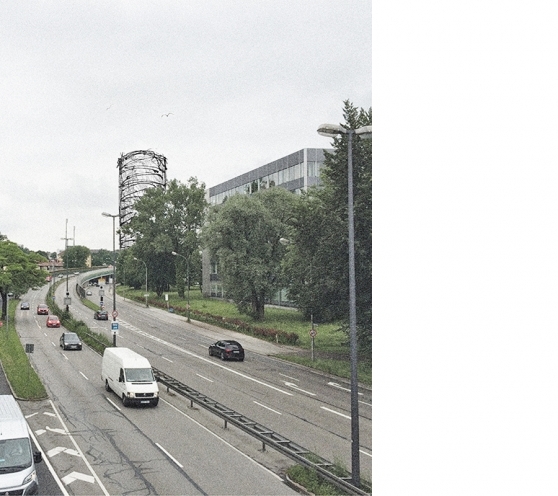 Even if it would be on a relatively small scale, we would like to generate a sense of urbanity. And this arises from the simultaneity of diversity, density and the juxtaposition of private and public activities. 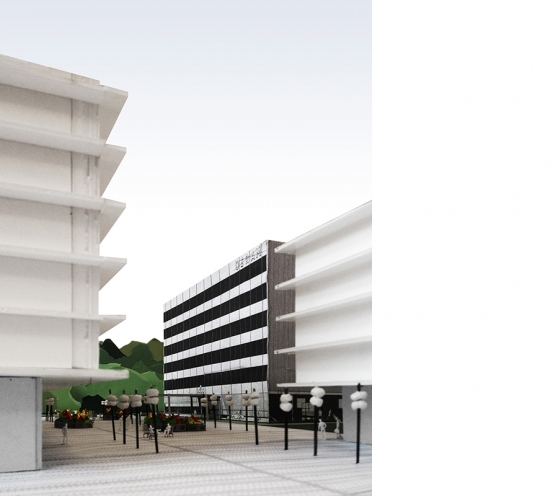 The Esplanade has these qualities, particularly because, beyond offering valuable public access to the Isar flood plains, it concentrates in its plinth access to apartments, day care facility, underground car park, Osram building, supermarket, shops, social spaces and services of the borough. 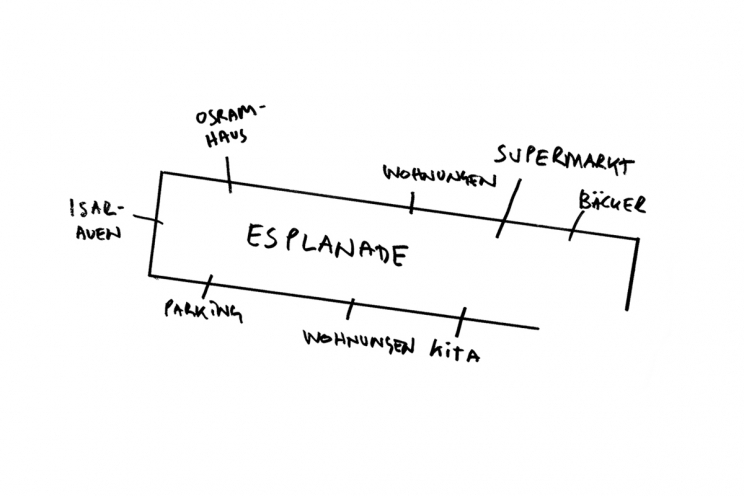 The Esplanade is a new space of possibility and encounter for the Borough of Untergiesing. In option A, the building is faithfully reconstructed and fitted with original fixtures and interior work. In option B, the building is maintained as an important vehicle of identity. With restored façade and as many of the original fixtures and interior work retained, the building is adapted to a new function. The principle of the façade and the typology of the floor plans are developed from the logic and architectonics of these large Mies-ian cubes: A large light well becomes the access area to the apartments. A double façade makes it possible to offer a generous and sheltered “inner garden”, that secures noise protection from the Candidstraße and generates a pleasant indoor climate. The outer façade can easily be modified to be openable with sliding windows instead of the current insulating glass and can also be very easily repaired. The climatic function will be taken over from the new indoor windows. Between the outer and inner glazing an insulated buffer space is created, which is also valuable as inner garden. 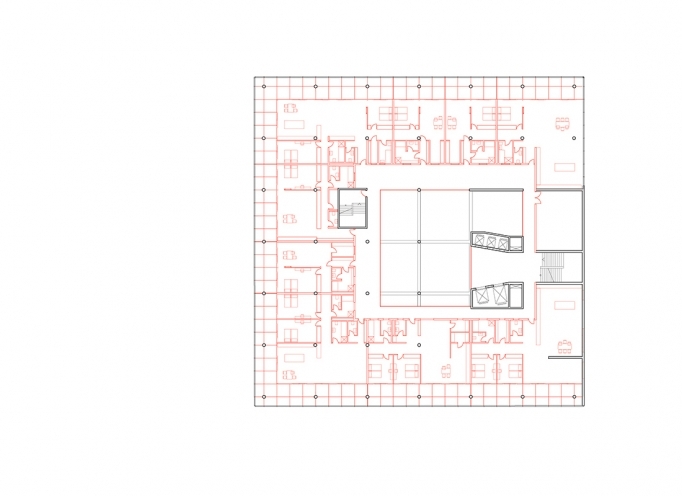 The floor plans are oriented according to the architectural example of Walter Henn: Ludwig Mies van der Rohe. 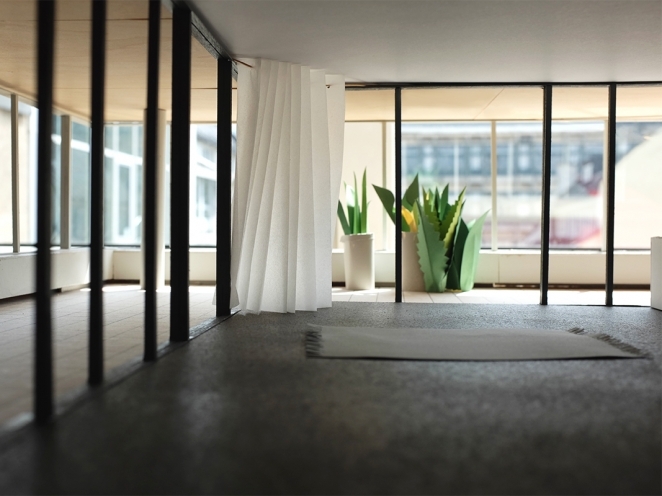 For his residential buildings in Chicago and Detroit he developed a clear system of a service core with spacious floor plans opening towards the outside. We interpret this principle in a contemporary way with large baths and a connection between living, eating and kitchen spaces. 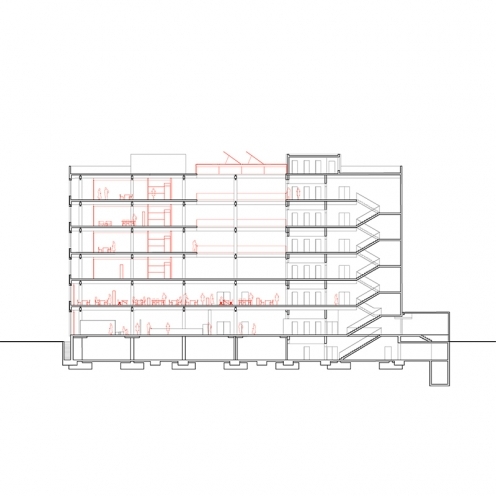 In the plinth of the building the ‘second’ façade is positioned directly behind the outer façade, to maintain an ‘original’ floor plan as far as possible. 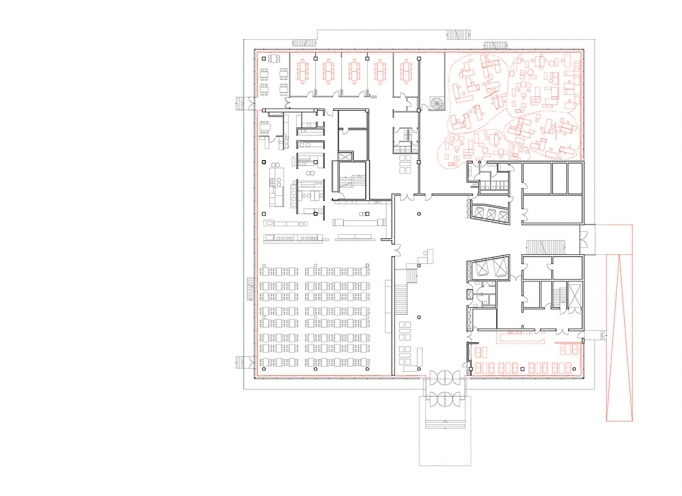 We propose community and commercial uses that arise directly from the history of the building: the previous Osram staff canteen will become a restaurant, the casinos will become catered meeting spaces. 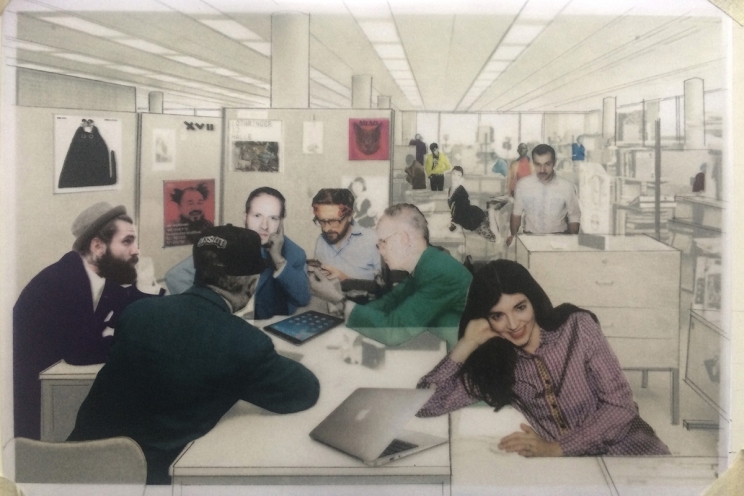 On the northeast corner, we propose a reconstruction of the ‘original’ open plan offices as co-working spaces. Outdoor eateries in the southeast corner will contribute to the enlivenment of the building and the esplanade. 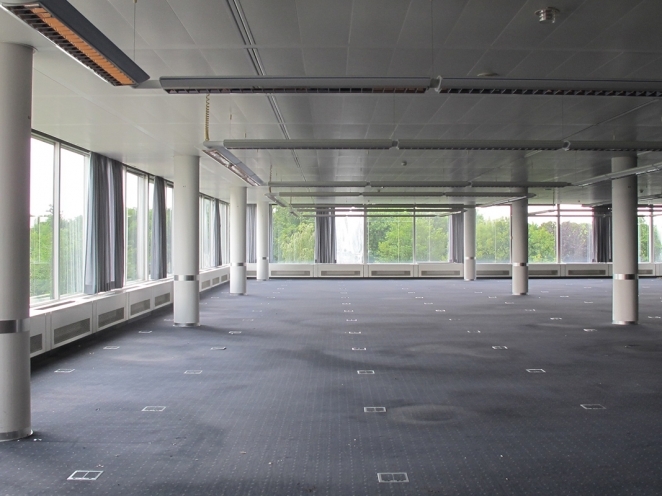 In addition to the requested purely residential use, we could also imagine additional office space on the first floor, which would allow a complete reconstruction of an open-plan office space. 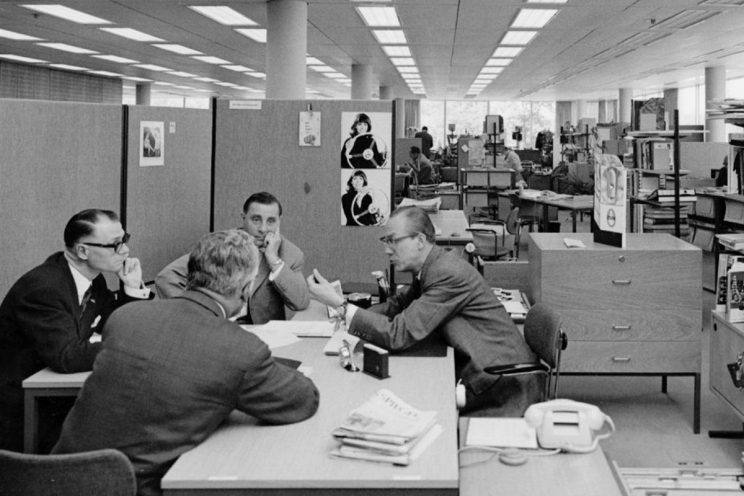 In other cities co-working offices of a similar size are economically very successful (i.e. the secondhome’ in London (http://secondhome.io/) or Betahaus in Berlin). From the perspective of the envisioned ‘complete offer’ of the new Osram Quarter, such an addition to the programme would be desirable. The beautifully furnished, reconstructed stairwell that in light of the contemporary ‘vintage culture’ is highly appreciated, serves as a foyer for the ground floor uses and more importantly also for the high quality residential uses of the upper floors. On these residential floors the closed indoor space of the foyer is reinterpreted as an open ‘light well’ in which the rational construction and the structure of the building are made visible as abstract sculptures. The new buildings are scaled according to the Osram architecture and conceived as urban high rises with inner courts providing access. In Building 2 noise insulation is achieved through a north facing façade with a protected arcade for access. This continues as a noise protection wall until Building 1. The building typologies proposed by us are consciously rooted in the architectural legacy of modernity. Exemplary is the hard work spent on the ‘minimal space for subsistence living’ as well as the development of a new ‘modern’ sense of living – the connection between inside and outside. In the 20th century this compressed legally valid typologies, which today sadly have often and undeservedly fallen into disrepute or oblivion. Considering the current discussion around ‘affordable’ housing, we consider there to be great potential in the revival of this forgotten tradition. Building 2 is conceived as a lively large block with diverse apartments and forms of living. On the ground floor it embraces a supermarket with bakery as well as double story work-live apartments. These units will enliven the esplanade and inner courtyards outside of the limited opening hours of ‘conventional’ commercial units. In the residential floors above, the access areas also facilitate encounter and identification of the residents with ‘their block’: the arcade apartments will receive ‘front gardens’. The arcade will be kept at a distance through light openings. The inner hallways of the minimal residential units, oriented East to West, open into wide-open stairwells. To the south large family units with spacious loggias are envisioned. The building is constructed in a serial manner: extensive prefabrication or building with a wood construction system are possibilities. A sustainable affordability of the flats will be achieved because of the rational construction, robust materialisation and the reduced living spaces mentioned before. The residential high rise on top of a parking garage that we propose in option A, similar to the Marina Towers by Bertrand Goldberg, could become a modernist impulse encouraging traffic for the area, which is located directly on the middle ring road. We cannot comprehend the voluntary height restriction self-imposed by the competition. The economic argument against residential high rises, which was mentioned in the proceedings of the colloquium, is outweighed by the numerous very successful examples around the globe (and the few in Munich). We consider this location to have great potential to provide high quality residential spaces, in exactly this form of housing and in connection with ideal accessibility, good location and splendid views. Noise protection can be accomplished through a simple double-skin façade, which will further increase the comfort, functional possibilities and ecological qualities of the apartments. In Building 4 we increased the distance between the gridlines and provided all the apartments with large garden terraces facing towards the (quieter) south. They have a ‘stacked’ typology, familiar from the beloved flats of the Olympic village. Again, the plinth of the building is enlivened with additional functions: live-work units are interspersed with social uses such as a day care centre or a community meeting space. The necessary functional spaces such as bike storage are included as well. Similar to all the other buildings, Building 4 is connected to an underground parking garage.